Initial payment of $199 must be paid online. 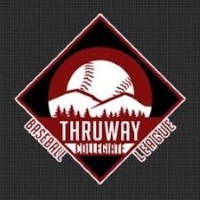 Option to pay second and third installments for Thruway Collegiate Baseball league can be either online or by check. Housing: There is no housing in this league. All players should be from the Upstate New York region. Helmets, balls, etc will all be provided by the TCBL. Composite wood bats will be provided to each team. Players are welcome to bring their own composite or wood bats as well. Each player will be issued 2 sets of jerseys, a pair of pants, socks, a hat, and a belt. All games will have live stats and live video feeds. Updated statistics will be available on the TCBL website. NCAA rules will apply to all games. Batting practice and infield/outfield will be available for most pre-games. Tobacco of any kind is not allowed per NCAA rules.